Previous research evaluating hydrocarbon toxicity to corals and coral reefs has generally focused on community-level effects, and results often are not comparable between studies because of variability in hydrocarbon exposure characterization and evaluation of coral health and mortality during exposure. 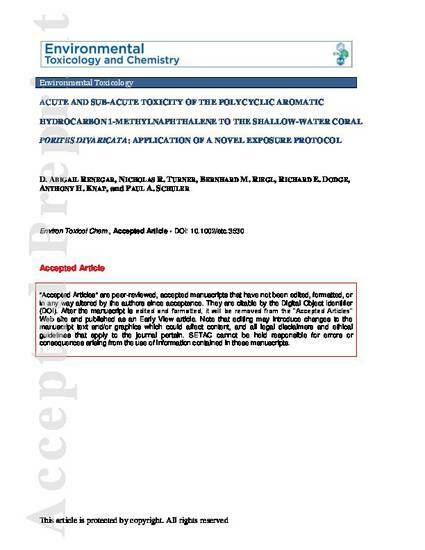 Toxicity of the polycyclic aromatic hydrocarbon 1-methylnaphthalene to the coral Porites divaricata was assessed in a constant exposure toxicity test utilizing a novel toxicity testing protocol uniquely applicable to shallow-water corals, which considered multiple assessment metrics and evaluated the potential for post-exposure mortality and/or recovery. Acute and subacute effects (gross morphological changes, photosynthetic efficiency, mortality, and histologic cellular changes) were evaluated during pre-exposure (4 wk), exposure (48 h), and post-exposure recovery (4 wk) periods. Coral condition scores were used to determine a 48-h median effective concentration of 7442 μg/L. Significant physical and histological changes resulted from exposure to 640 μg/L and 5427 μg/L 1-methylnaphthalene, with a 1-d to 3-d delay in photosynthetic efficiency effects (ΔF/Fm). Pigmented granular amoebocyte area was found to be a potentially useful sublethal endpoint for this species. Coral mortality was used to estimate a 48-h median lethal concentration of 12 123 μg/L.